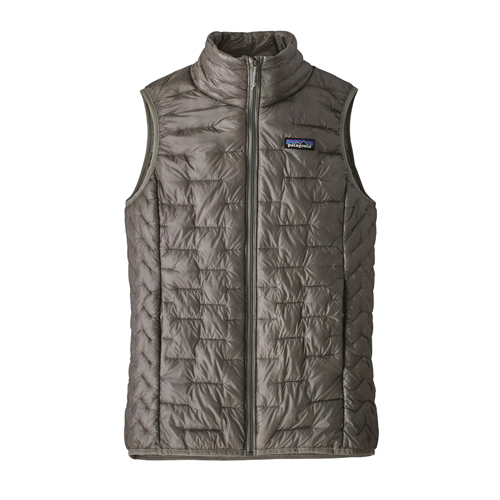 The highly packable Patagonia Women's Micro Puff Vest is hydrophobic and will keep you warm even when it is wet. This vest has synthetic insulation that looks like down and will keep you warm. The best warmth for weight of any vest Patagonia has ever built, the Micro Puff Vest delivers ultra lightweight, water-resistant, down-like warmth with PlumaFill synthetic insulation–a revolutionary featherlight down alternative. This vest is warmer than the nano puffs, moves with you due to the baffling and is very durable. The unique construction of the Micro Puff collection prevents shifting, clumping or cold spots for the life of the garmnt. This new PlumaFill insulation feels like down and has shown exceptional resiliency and loft retention after washing. on 11/8/2018 A must have!!! This vest is the best item in my closet. It is lightweight yet warm and very versatile. It looks great with a plaid shirt and jeans, over a dress, or with a comfy pair of leggings. Highly recommend!